I wanted to be able to keep a pen with my soft cover Moleskine notebook, but I didn’t want to over stretch the elastic or have the pen sticking up above the notebook where it would get knocked around. I also didn’t want to add something ugly to the notebook which would decrease my enjoyment in using the journal. My solution was to cut a slit in the front and back covers and glue in a decorative piece of leather to hold the pen along the spine of the notebook. I know, it’s not the most creative hack, but it works well and is super simple to do. I chose leather for my hack because it is strong and won’t fray on the edges, but you could use fabric, vinyl, tyvek or other interesting material as long as it wont tear of fray. 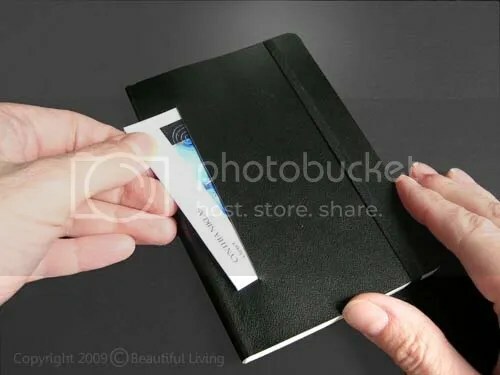 Moleskine Hack: Adding a pen slide to your soft cover notebook. I started by deciding how large I wanted my leather to be. It needed to be tall enough to keep the pen from moving around, but short enough to keep stability in the covers of the notebook. 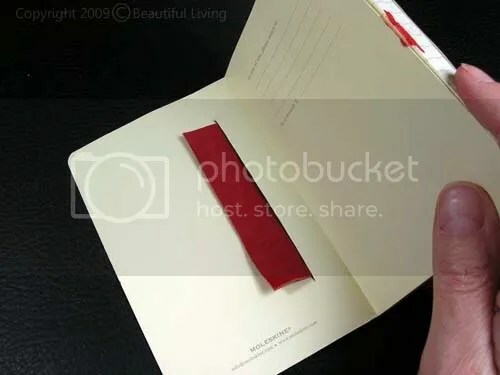 The width needed to be wide enough to glue the edges on the inside of the front and back covers and to allow space for a pen to slide along the spine. 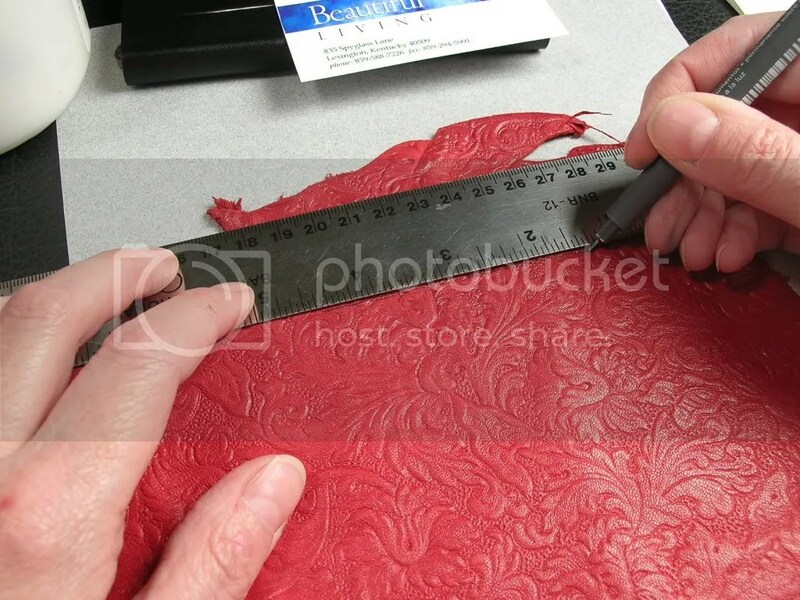 For my use, the leather measured 4 1/8″ wide by 3 1/2″ tall. This gave me a 1/2″ by 4″ long glued area on the inside of both covers and created a pen slide that was snug, but still permitted the pen to slide in and out. I cut the leather so it would wrap around the notebook and pen with enough extra to glue into the inside of the Moleskine's covers. The slit on the covers needed to be about 4″ high, which was a little bit larger than the leather giving me room to slide the leather in without puckering. The cuts were made 3/4″ in from the spine on both sides. 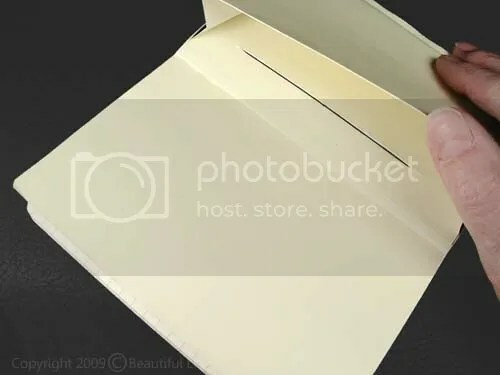 When making the cut on the back cover, I put a piece of cardboard between the back cover and the expandable envelope to prevent me from cutting through the envelope. I cut slits in the Moleskine's front and back covers that were 4" tall and 3/4" away from the spine. The slit was centered vertically so they would be at the same height on both sides. A completed slit in the back cover. I used a piece of cardboard between the envelope and the inside of the back cover when cutting this slit to avoid cutting through the envelope. When I glued the leather in place, I decided it was easier to glue the leather into the back cover first because the position of the envelope in the back cover leaves little room for your fingers to move around. Next, I put the pen in place on the spine and wrapped the leather around it and through the slit on the front cover. Once the leather was snug around the pen, I glued it into the front cover, closed the journal and placed a heavy book on top until the glue dried. Finally, I slid the leather through the slit in the front cover, made sure the pen was snug and glued it into the front cover. A heavy book was placed on the journal after I closed it until the glue dried. 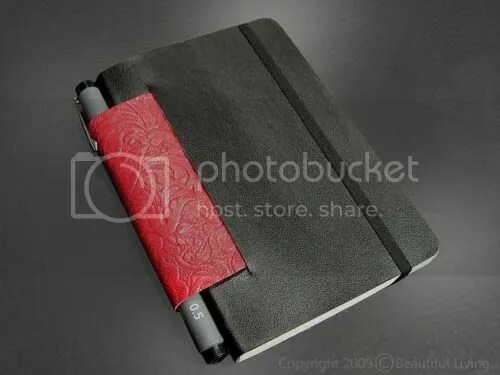 The end result is an attractive journal with a pen holder. If you don’t want a pen slide, but you need a place to stash a few extra business cards, the 4″ slit is just the right length and can be used on both front and back covers. If you use the slit on the back cover, your business cards will slide right into the packet on the inside of the back cover. A 4" slit is just the right size to slip a small stash of business cards if you prefer.